Since it’s the close of 2016, I thought I’d do a review of the winners and losers among the things I’ve bought this year and last. Being new to cycling, I made a lot of mistakes at first, but I quickly discovered that while price is generally (though not always) a guarantee of quality, good kit can be had at all price points. Although it hasn’t arrived yet, I’ve just ordered an Endura Windchill II jacket, which I hope will prove to be the stretchy waterproof jacket I’ve been looking for. Without a doubt, the favourite item I bought this year was the Janus Sportswool merino hoody. In pure merino, around 272gsm, these items are warm, thick, soft, tightly woven, come in attractive colours with contrast stitching and have the most useful, fabulous balaclava-style hood. I now own three of these tops and will buy more in other colours if they become available. The other item you’d have to pry out of my cold, dead hands, would be the Sheila Moon brushed supplex winter tights, with their soft crossover waistband and comfortable chamois. 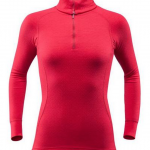 Devold Women’s Active zip-neck tops: very comfy, look fantastic, nice and warm. * Devold Women’s Sport long-sleeve top: useful long crewneck base layer. 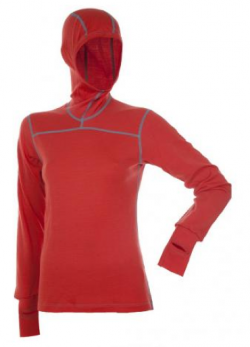 * Devold Women’s Merino Expedition Hoodie: long, stretchy fabric and a well-shaped hood. * Woolpower 400 merino vest: comfortable, warm and snug. * Ulvang Womens Training Long Sleeve Merino Top: beautifully designed merino top. * Mountain Warehouse Adrenaline women’s Iso-Vis waterproof jacket: plastic-feeling but very windproof and waterproof, and a bargain for the price. * Endura Pacajak: highly useful waterproof pop-on jacket. * Karrimor Long Sleeve Running T Shirt Ladies: cheap but highly visible and handy. * Sheila Moon brushed Supplex winter skorts and knickers: incredibly comfy, warm. Sheila Moon summer cycling dresses, shimmels, lingerie knickers and lingerie shorts: all very comfortable and attractive. * Sheila Moon winter cycling jackets and hoodies: all attractive and comfortable. * Georgia in Dublin Rainwrap: attractive rain shield that works very well. * Rohan Troggings: great, comfortable trousers for the bike, worn over shorts. * DNB Women’s Flashlight Thermal Vest: high-vis, well-made, comfy, very warm. 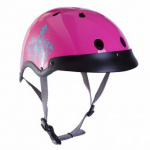 * Sawako Furuna ladies’ bike helmet: very stylish and attractive helmet, adjustable. * New Balance WX624AB3 B trainers: windproof, sturdy shoes for cycling and general use. Defeet Duragloves e-touch: very comfortable, practical, hi-vis and warm. * Corrymoor Explorer mohair terry socks: incredibly thick and warm socks. * RCP double bike panniers: simple, sturdy, capacious, tough. BTR Bicycle Rear Rack Pannier Bike Bag: well designed, sturdy, practical. * New Ergo pink rubber ergonomic handlebar grips: very comfy and work really well. * Cateye 9 CC-VL 820 bike computer: does everything I need it to do. * Salmon Koolstop brakes: work like a charm. Brooks B67s saddle: fabulously comfortable and made my rides a lot easier. * Schwalbe Marathon Plus tyres: comfortable ride and not had a puncture since I put them on. * Enzo Buttonhole Cream: pleasantly textured chamois cream with menthol. * Medipure medicated body powder: pleasant corn-starch-based dusting powder. * Gold Bond medicated talc: fabulously menthol talc-based powder. * Helly Hansen Merino Warm Freeze Half-zip Pullover – plasticy and cheap-feeling. * Janus women’s Designwool long-sleeve zip top: hard texture and went baggy very quickly. * Janus women’s Blackwool shorts: like huge granny pants, though the fabric is nice. * DNB Women’s Flashlight Thermal Long-Sleeve Jersey: sleeves aren’t windproof. * Xenofit Second Skin deer tallow cream: greasy and unpleasant-smelling. * Morgan Blue soft chamois cream: basically just an aqueous cream. Basil 25l double panniers: flimsy and poorly made. * Third Eye Eyeglass Mirror: didn’t work with my narrow spectacles. * Busch & Muller Cyclestar 80 mirror: constantly worked loose – had to replace it.